MarketGoo is an easy to use (Do-it-Yourself) Search Engine Optimization (SEO) tool design for Small and Medium Businesses. It helps you to optimize your website for search engines like Google and to improve your ranking, which leads to more traffic. To benefit from MarketGoo you don't need to be an expert in SEO nor have a lot of technical knowledge. MarketGoo explains in easy to follow steps what you can do to optimize your site and how to go about it. MarketGoo analyses your website on an ongoing basis to create a comprehensive Report in an easy to read overview and a fully customized SEO action Plan. Your dashboard starts with your overall Score; the higher the Score the better. The Score calculates with an algorithm that takes into consideration all aspects of your site that influence SEO, which shows a progress score that you can track over time. Read: How is your MarketGoo Score Calculated? Checking your scan on demand (when you’ve worked on your site and you want to see results immediately). Score Progress (optimizing your site is an ongoing process). Your SEO score progress will display the current status of your overall MarketGoo SEO account. This area links to the task and the MarketGoo On Page optimization summary to which you can dig deeper with prioritizing and understanding what improvements and corrections your website needs as a whole. Under this section, we have wrapped all the familiar MarketGoo dashboard points and tucked them neatly so you can explore it all at a glance. 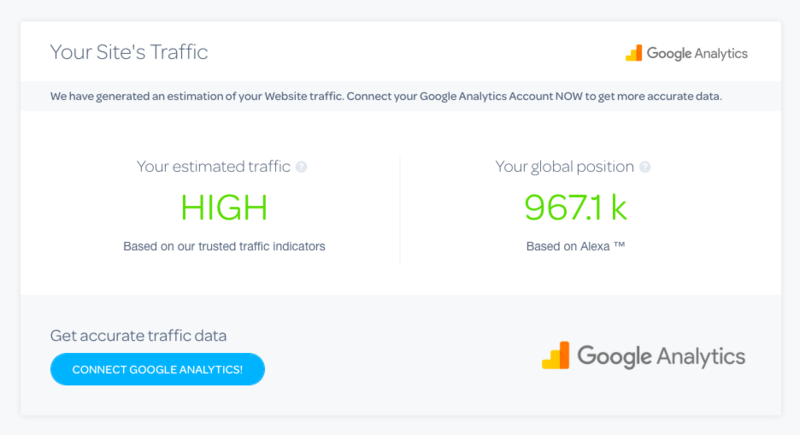 MarketGoo provides a brief summary of your website ranking through an algorithm that is linked to search engine based on traffic estimation of their website and their global position based on Alexa™ rank. It may take a while until they would have enough visitors to display any data, especially if the customer website is new so we also recommend asking your users to link their Google Analytics account for in-depth data analysis. This section displayed how your customer website is received by the top Search Engines. They can see when their page has been indexed by Google, Bing and Yahoo. In circumstances that where the site is brand new, it will usually take 8-10 weeks for the site to be found at the same time, it takes at least several months, for your customer site to improve its ranking. Here you can check out how your site is ranking for your selected keywords with the main Search Engines; Google, Bing and Yahoo. You can see how well you are doing on the keywords you are tracking within the last 15 days up to the last 3 months and also compare this to your business and website competitors which is important for strategizing your campaigns. Know how much percentage of the tasks have you achieved and need to work on. This shows the rate at which you are progressing with improving your website for you to always be on track with your SEO goals. Site Review lets you know if your site has any technical issues that you should be aware of, say for example, your site's size, speed, redirects, and error pages, among other things that contribute to your visitors' experience. If these elements aren't optimised, not only will your visitors leave your page, but your position in search engines will be affected. This section highlights key elements where search engines focus on a website like user experience, whether it seems built for people and not search engines. If potential visitors see clear and accurate titles and descriptions of your site in a search engine result. Which triggers users that they are more likely to click on it than on one that doesn't make sense to them. The items in this section are helpful in sending traffic to your website because they act as summaries of your site content, helping your potential visitors to identify what it's about. The issues detected can also be fixed on demand so no need going around looking for the next task to be done. Also, if you have very little visible content compared to the amount of code, or don’t have a blog, it is harder for the search engine to recognize it as a useful or credible site. With the current SEO trends, it is true that most searches are done from mobile devices, so it is extremely important that your site is optimized for phones and tablets. This section shows how fast your site loads and tells you what you can do to make it faster and alerts you with issues to access on a mobile site and helps you fix them on demand. For a website to be labeled as responsive, we check that the website fits within a range of 340/360 pixels wide window. 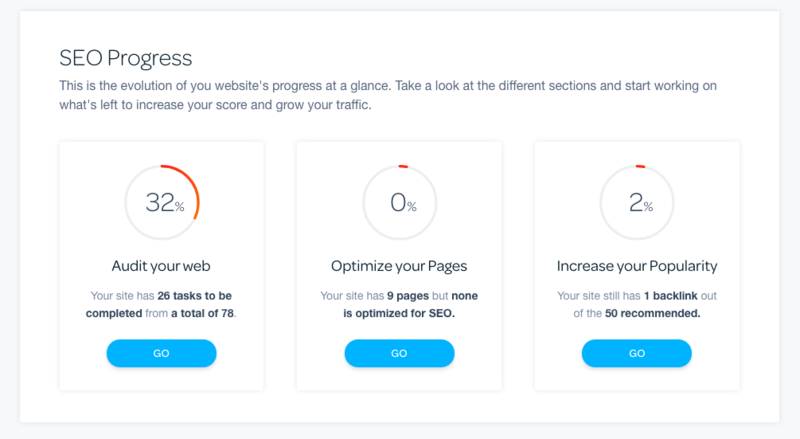 One of MarketGoo's key selling points is this feature, where you can access directly anywhere you are inside the platform so you would always be reminded that you need to optimize your website. This dynamic page optimization tool where you can select your monitored keywords and assign them to each page on your site helps you to fix and improve the content of every page for the keyword you assigned, making it friendlier and easier for search engines to access in order to increase your rankings over time. The more popular your site is, the higher it will rank with search engines, that is why it is important to work on increasing the popularity of your site. Popularity is measured by the number of links pointing to your website. The more links, the more credible your website is. MarketGoo analyses the number of links and tells you how you can increase them. This section displays how websites are linking to you including social media. Since a lot of content is shared on social media, so it is vital that you are in the loop with the changes and progress of your social media segment. A lot of content is shared on social media, so it is vital that your company is present there. And while you're at it, feel free to follow us on Social Media to get to know more about our company culture and updates! Learn how to promote your business with us! Understanding our tool is one thing, but what about marketing? The success of your website and your business will depend mostly on how you promote it. That’s why we are creating marketing resources for you. Take a look and subscribe to get the Latest post.